Maxxiz V2.1 - Responsive Magazine News Blogger Template | BloggersStand ';-1!=b.indexOf("img.youtube.com")&&(a=' ');d=a+''+p+''+titlex+"
Maxxiz V2.1 a blogger theme with responsive layout. Its High User Friendly Blogger Template. Its design simple and clean and perfect for magazine or portofolio websites. With an attractive color combination and impressed professionals and has many features. 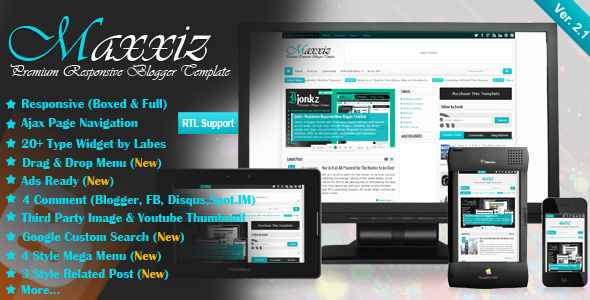 Get premium Maxxiz V2.1 New updated version download for free.News/Magazine style responsive seo ready best 2017 blogger/blogspot themes. 1 Comments on "Maxxiz V2.1 - Responsive Magazine News Blogger Template" So Far - Post Yours!